Anyone interested in Ikebana is welcome to join our mailing list for free to receive our newsletter. We don't sell or give away your Email address. Tickets are selling fast. There are only 77 tickets left. Wa website, http://waikebana.blogspot.com will help promote you, your work & your business, if you are a qualified ikebana teacher. We will start a series of posts on “our exhibitors”, introducing you and your works. Hope this will encourage more people to exhibit with us. Please send 2 images of your works (0.5 Meg or less each), your short Bio (up to 200 words), and websites, Facebook accounts etc to wa.ikebana@gmail.com. Your work and your contact etc will be published in our site, Facebook and Instagram. It seems that we will have several international exhibitors including Japanese qualified teachers. Please write a short article, “Ten things to do in Melbourne” for our guests and for those who may join us. Your article will be published in our website, http://waikebana.blogspot.com. 8 May 2019: Japanese Aesthetics - From Ikebana to Contemporary Art. 30 June 2019: Deadline for the Ikebana Gallery Award 2019. August 2019: Ikebana Gallery Award 2019 will be announced. 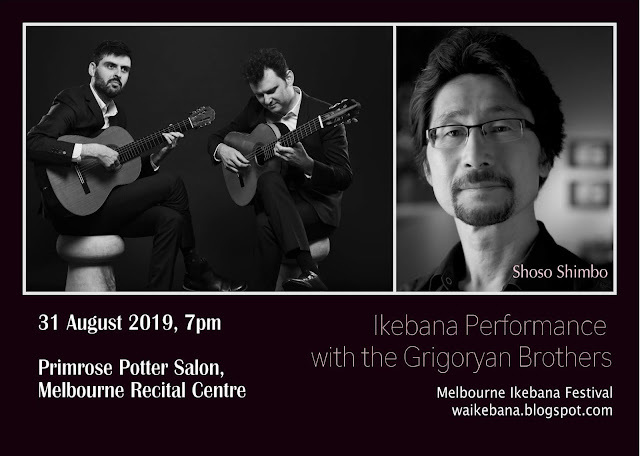 31 August & 1 September 2019: Wa - Melbourne Ikebana Festival, Abbotsford Convent. Ikebana exhibition, award, workshops, performances, demos & ikebana market etc. 30 September 2019: Deadline for submitting essay for International Journal of Ikebana Studies. Would you like to get your ikebana essay published? There are some changes again in class dates! Ou term 3 starts from August 2019. About 15% of our students transferred wrong amounts of fees last term. If you are not sure about our fee system, please ask in class. We will have 8 sessions in one term. Our fees are not negotiable and not refundable. The fee is valid only for the term in which you paid. You can pick any class you are able to attend from the dates specified in our class dates and pay session by session. We prefer that you book by email when you are planning to attend. This is very simple and flexible, and ideal for short time visitors to Melbourne, or people who are unsure how many classes they can commit in a term. A condition for the Discount Rate is upfront payment. If payment is not made full on the first lesson, the discount rate does not apply. This is non-negotiable. This option is available only for continuing students. The fee has to be paid during the first week of each term. If payment is not made full on the due date, the discount rate does not apply and only standard rate applies for the term. This is non-negotiable. It is your responsibility to check the due date each term. Continuing students means those who have attended at least 3 sessions in the previous term. “Regular students” who took a break for one term, for instance, are not continuing students in our definition. Those who have attended 8 sessions in one term and would like to attend extra sessions in the same term can pay $25 per session. If payment is not made on the day, however, standard rate applies. Ikebana Gallery Award is the first online Ikebana competition for all Ikebana students in the world and has been recognised as historically significant. This award provides the students with not just a special addition to their cv but also a rare opportunity to show their works, receive Likes and encouraging comments from more than 16,000 viewers around the world and international art experts. We are pleased to announce that Dr Mino joined the Ikebana Gallery Award Judging panel. Dr Mino is the Director - Hyogo Prefectural Museum of Art, the Vice Chairman - Sotheby’s North America, the Chief Executive Director - the 21st Century Museum of Contemporary Art, Kanazawa & the Honorary Director - Osaka Municipal Museum of Art. We are excited that Mr Yuichiro Hinata joined the IGA committee. Mr Hinata is a master teacher in Sogetsu School and director of Hanaike Battle, www.hanaikebattle.com. With introduction of a new text book 5 in Sogetsu school, we need to make some changes in our teaching diploma course. When you start a diploma course, please choose A, aiming to obtain the diploma ASAP or B, aiming to obtain the diploma at your own pace. Under our current course conditions, A is done in 40 to 60 sessions and B requires 80 to 90 sessions to complete. Please tell your intention and discuss with your teacher. If you choose A, there will be HOMEWORK. If you don’t do HOMEWORK, you will not be able to complete the course in time and we assume that your choice is B ( 3 to 4 years to complete diploma if attended 24 sessions per year). Please ask the details in class. This applies only to Shoso Shimbo’s courses. There will be some changes in our Ikebana exhibition 2019. It will be held at Abbotsford Convent on 31 August & 1 September 2019. It aims to be the largest and the most significant Ikebana event outside Japan. It will expand in many ways. It welcomes the exhibitors from all over the world. It focus on promoting Ikebana to the wider community, aiming to recruit more Ikebana students. We need new committee members as well as many volunteers. Please let us know if you are interested. So far following people have been appointed (there may be some changes): Shoan Lo (Treasurer), Shoen Loo (Secretary), Takako Routledge & Aileen Duke (Public Relations), Sue Healey & Takako Routledge (Venue Management), Aileen Duke (Administrator for Opening Ceremony). 12. Looking for Ikebana class near you? Is Murrumbeena too far for you? Some of Shoso’s students have been qualified to teach and are running their own classes. 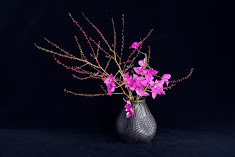 Shoso Shimbo and his team can offer many type of ikebana workshops now. You may be able to earn more than $200 per hour and donate $50 or more to a charity by hosting our popular one hour workshop. Shoso’s team has joined Salvos Community Fundraising. Share this story if you know someone who might be interested. Shoso teaches "Japanese Aesthetics: From Ikebana to Contemporary Art" at RMIT University Short Courses. It will be available for anyone (not just for RMIT students). This class will take participants on a journey to explore the theory of Japanese aesthetics through practical exercises. I was in your course this year & enjoyed it so much, I would like to do another with you next year. Hopefully the one starting in Feb.
Could you advise if you will be covering different topics. I don't mind repeating though but want to learn as much as I can for my second trip to Japan, April 2019. I may have a few friends also interested. I loved my recent trip & took up many of your suggestions, Nezu Gallery & garden, Cerulean Hotel, garden of New Otani hotel, plus sampled wagashi & bought some home, everything I saw & experienced was a delight. A: Our next course starts from 8 May 2019 with new topics. The course includes many trip advices on appreciating Japanese art. Please book early. Shoso has made his 2016 Reflections Collection available to purchase as an e-book. Please follow the instruction, particularly the size of the photo to send. You work may be published on our blog, but this exercise does not contribute directly to your Sogetsu certificate. IJIS, v.5 has been published. IJIS is looking for ikebana essays. This is a great opportunity if you would like to add publication in your cv. Some of Shoso’s articles are now available for download. a. Subscribe to a newsletter (this newsletter) from the News page in Shoso’s website. All of Shoso’s students have to join our email group. You can see some of the works by Shoso's students on this page. e. Shoso's Japanese blog contains all of the works he has had published monthly in the Japanese community paper, Dengon Net. 20. Where can I see Shoso’s works in Melbourne? Floating bamboos and a couple of ikebana sculptures are usually on display. Shoso’s flowers will be on display from Christmas day to the New Year day. a. http://www.shoso.com.au will host Ikebana online courses soon. b. Visit following shops for Ikebana containers, etc. h. Japanese garden designs by Shoso Shimbo. Ask for a free quote. (1) Shoso has designed a Japanese zen garden for Komeyui Japanese restaurant. (2) Shoso's home garden was selected as one of the top ten gardens in the city of Glen Eira. (3) Vertical garden at Mondopiero, Fitzroy. One pairs of Ikebana secateur are available now. Priority is given to those who are doing our certificate courses. $45 each.